projisert 360 grader opp i taket. Interaktivt betyr at du fÃ¥r informasjon tilbake. home in an adults-only house. impression of a full 360-degree planetarium. learn all about the positions of the stars. the night sky on your ceiling. house for an impromptu astronomy/astrology session. at his as at yours. 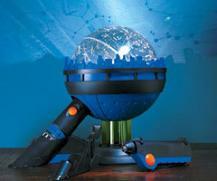 Transform any room into an amazing 360 planetarium.